"To all my friends and relatives in Alcoholics Anonymous," I began, "I say that they were right to become intoxicated. Life without moments of intoxication is not worth 'a pitcher of spit,' as the felicitous saying goes. They simply chose what was for them a deadly poison on which to get drunk. "Good examples of harmless toots are some of the things children do. They get smashed for hours on some strictly limited aspect of the Great Big Everything, the Universe, such as water or snow or mud or colors or rocks (throwing little ones, looking under big ones), or echoes or funny sounds from the voicebox or banging on a drum and so on. Only two people are involved: the child and the Universe. The child does a little something to the Universe, and the Great Big Everything does something funny or beautiful or sometimes disappointing or scary or even painful in return. The child teaches the Universe how to be a good playmate, to be nice instead of mean. From "Fates Worse than Death" and "Bluebeard"
hi! where can I find this quote in the books? Hi Clare! In my copy of Fates Worse Than Death, this quote begins on page 45, in chapter III. 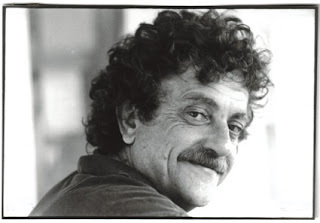 Introducing the quote, Vonnegut says that it was included in a preface to the Franklin Library edition of Bluebeard, which I don't have.